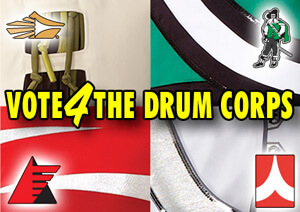 LAST CHANCE: Vote 4 the Drum Corps! Carolina Crown, The Cavaliers, Colts and Phantom Regiment are among 100 nonprofits who have been vying for grant money this past week as part of the Chase Community Giving campaign on Facebook. With a top prize of $1 million and five $100,000 grants for runners up on the line, these four corps need a final push of support! The last day to cast your ballot for these worthy organizations, is today, Friday, Jan. 22. Head over to Facebook to place your votes before 11:59 p.m. ET! Take action and then tell your friends!